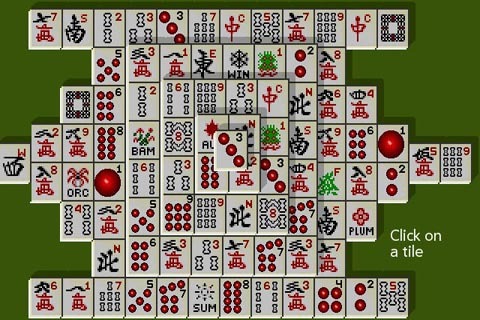 Lopan is a free version of the classic tile-matching game Mahjongg solitaire. It is available for HP/Palm’s webOS devices. The game features multiple backgrounds and tile sets. The basic rules are very simple. Tiles which are not blocked in from both the left and right or are not blocked from above may be removed in pairs. Each set of tiles contains four tiles. Pairs are made naturally for the numbered tiles. There are also a number of special tiles. These are the four winds, the four flowers and the four seasons. Any tile in these sets may be matched to another tile from the same set (i.e. winds with winds). There are also four tiles for each of three dragons: The green, white and red dragons. The dragons match in normal pairs. For more information on the rules and history of Mahjongg Solitaire please visit this site. Remember: There are two pairs for each set. Be sure not to block one pair in a set when removing the other pair. Think through your moves! If you get stuck, you can always request a hint with the ‘h’ key. If you need help with the app or experience problems playing it please use our Contact page. We welcome all feedback and are committed to improving our products. – add a preferences page to let Lopan remember my preferred layout and tileset. – add a “scramble” feature when there are no more tile matches.